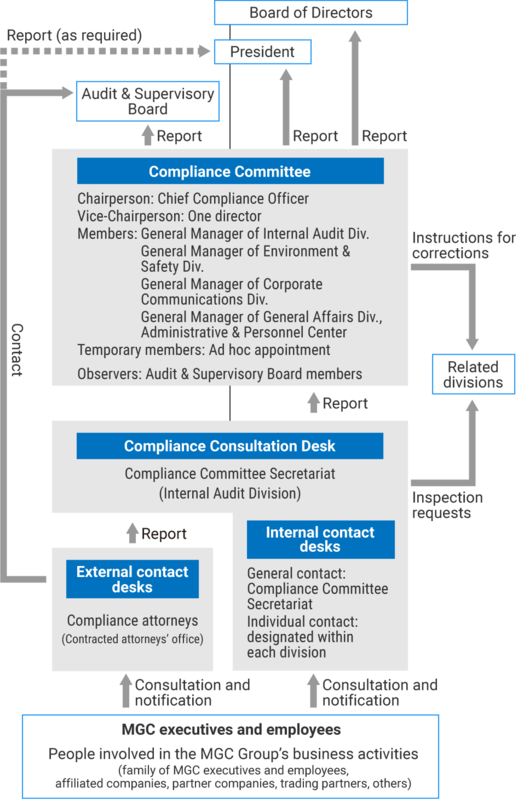 Compliance System | About MGC | Mitsubishi Gas Chemical Company, Inc. In order to implement management in such a way as to emphasize compliance, the following systems and organizations are in place. The “Compliance Regulations” define items necessary to the MGC compliance system. The “MGC Corporate Behavior Guidelines” in the “Compliance Regulations” act as the basic guidelines for the compliance system. Separate from the regulations, the “MGC Code of Conduct” stipulates basic items that all employees must observe during their daily business. A Compliance Committee has been established to preside over the compliance system, prevent misconduct before it occurs, and also to deal with individual cases of compliance violation. A Compliance Consultation Desk has been established to assist with confusion over judgments concerning compliance problems, and for cases in which compliance violations are not, or it is feared will not be, rectified via the corporate system. Officers and employees, including temporary and non-regular staff, have an obligation to be compliant and should they become aware of any violations of compliance, to rectify these via the corporate organization. The first principle of compliance is that problems are resolved within the existing corporate organization, that is, within everyday work. The “Compliance Committee” presides over compliance for the corporate group, under the direct control of the president. The Compliance committee is composed of the Compliance Officer (Chairperson), director(s)（Vice Chairperson）, and the head of compliance-related departments, and have the following duties. Establish and discuss the group compliance system, policies and measures etc. The policies, guidance/supervision related to compliance discussed and established by the Compliance Committee, and corrective measures and reoccurrence prevention related to violations will be reported to the president and Audit & Supervisory Board, and implemented as per standard company procedure. Further, MGC group officers and employees must cooperate with Compliance Committee investigations. When there is confusion over judgments concerning compliance problems, advice can be received from the Compliance Consultation Desk. In addition to officers and employees, their families, affiliated companies, partner companies, customers, and anyone involved in business activities with MGC group can consult with or provide information to the Compliance Consultation Desk. As a rule, the Compliance Consultation Desk will require that you reveal your department and name for consultations and reports so that you can be contacted with the results of investigations or deliberations and to deter malicious libel and slander. Further, you are requested to make your consultations and reports by letter, FAX, e-mail or other media that leave a record. However, the Compliance Committee secretariat division will accept anonymous phone calls or Faxes only when circumstances render it necessary to do so. However, please be aware that investigations or consultations with an anonymous complainant may sometimes prove to be insufficient. All consultations at the Compliance Consultation Desk will be immediately reported to the Compliance Committee chairperson in cases where it is possible that a serious compliance violation has occurred. The Compliance Committee will conduct investigations of fact relevance, take necessary measures such as corrections and reoccurrence prevention, and inform the consulter/reporter of the results. Compliance Consultation Desk shall protect the privacy of consulters, reporters and persons cooperating with the investigation and shall not reveal their names nor the fact that they made a report to anyone other than the concerned parties. MGC group officers and employees who make consultations and reports shall not be subjected to such disadvantageous actions as transfer or discrimination due to the consultation or report or due to cooperation with an investigation. In the case of partner companies or customers, instructions will be given to the relevant department/group company so as to confer no disadvantage. However, if the consultation or report is made with the objective of falsely accusing another person, or with the objective of extortion, blackmail or other illegal motives, this restriction shall not apply. Please inform the Compliance Consultation Desk of an interested party among members of the Compliance Committee or the Compliance Office at the time a consultation or report is made to insure that the matter will not be disclosed to that member. If it is determined that the problem may have a significant impact on the Company's business or management. If it is determined that there is a need to report directly to the management because the Compliance Committee Office is unlikely to be able to handle the problem adequately.